Background: Obstructive sleep apnea (OSA) is a growing problem affecting millions of people in the United States. The prevalence of OSA has risen drastically in the past few decades concurrently with the increasing prevalence of obesity. Subsequently, there has been an ever-increasing rise in the use of continuous positive airway pressure (CPAP) devices. While using CPAP devices may lead to many adverse effects, the majority of these effects are described as relatively benign. Case Report: We describe the detailed clinical course and outcome for a patient with otic barotrauma as a result of excessive self-titration of CPAP therapy in an in-home setting. We also discuss the pathophysiology of otic barotrauma and present a review of current literature on the topic. Conclusion: While the benefits of CPAP are clear, we must take into account the rare but possible effects on ear structure and function. Many studies describe an increase in middle ear pressure with the use of CPAP, but few describe the effects of this increased pressure on the middle ear, such as the otic barotrauma described in this case. Given the increased prevalence of OSA, it is important to understand the risks associated with CPAP therapy. Adverse effects from CPAP use are numerous and most commonly include congestion, dryness of the oral and nasal cavities, aerophagia, epistaxis, sneezing, and sinusitis.3 We present a case of otic barotrauma resulting from excessive self-titration of CPAP in an in-home setting. A 50-year-old obese male presented in 2007 with a concern of snoring. He reported that in 2005 he was diagnosed with OSA. Polysomnography at the time of diagnosis revealed an apnea-hypopnea index of 57.5 with oxygen desaturations to 84%. He had never been titrated for CPAP therapy and had returned to the clinic at this time because of worsening symptoms. The patient subsequently underwent a CPAP titration study. Snoring and apneic events were eliminated at a pressure of 15 cm H2O. The patient was seen intermittently during the next 4 years until 2011, when he presented to the clinic with a 1-week history of sudden hearing loss with the sensation of aural fullness, pain, and a pop sound in the right ear that had begun suddenly after excessive self-titration of CPAP. He also reported sudden onset tinnitus but denied any symptoms of vertigo. During examination, no perforation of the tympanic membrane was observed; however, there was evidence of a significant clear serous effusion. Further questioning revealed a history of weight gain and subjective improvement in his OSA symptoms as he systematically increased the pressure on his CPAP machine. On the day his hearing loss began, he recalled turning the CPAP up to the maximum allowed setting. Audiograms were performed and compared with baseline audiograms performed in 2007 (Figure 1A). Audiometry revealed significant mixed hearing loss in the right ear (Figure 1B). A computed tomography scan of the temporal bones showed complete opacification of the right middle ear cavity and right mastoid air cells (Figure 2). The ossicles appeared to be intact, and the inner ear structures appeared to be normal. The patient was started on a prednisone taper and ciprofloxacin but had no improvement in hearing or tinnitus at follow-up 3 days later. A repeat audiogram performed 1 week after initial presentation revealed modest improvement in hearing (Figure 1C). At follow-up 2 weeks after presentation, a repeat audiogram demonstrated more significant improvement in hearing (Figure 1D), and the patient was followed on an as-needed basis thereafter. A perilymph fistula was suspected; however, the patient elected not to undergo exploratory tympanotomy because of the improvement in his hearing loss. Audiometric analysis of hearing loss in the right ear. A: Prebarotrauma audiogram reveals a baseline mild mixed hearing loss. B: Audiogram at initial visit demonstrates moderate to severe mixed hearing loss. C: Audiogram at the 1-week follow-up shows some improvement in hearing but still moderate to severe hearing loss at higher frequencies. 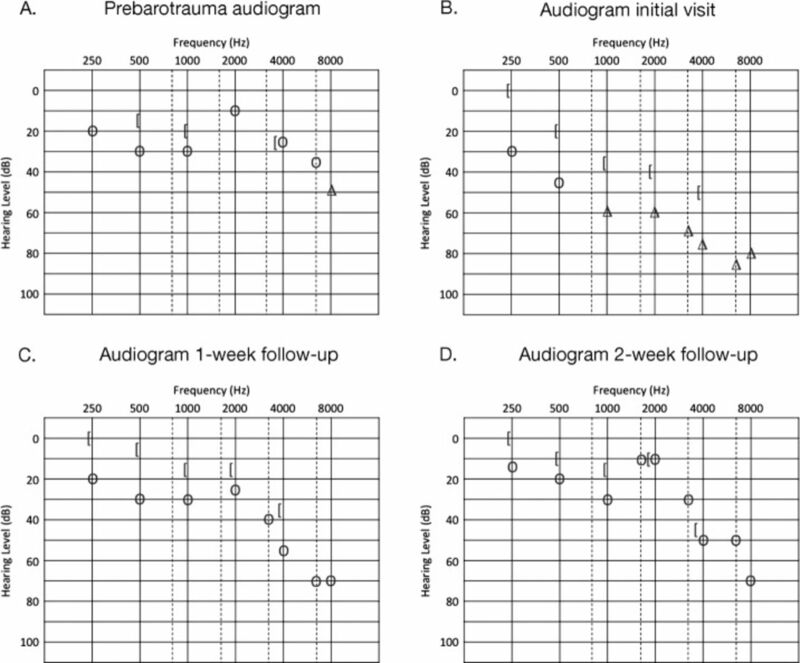 D: Audiogram at the 2-week follow-up with continued improvement in hearing. O, unmasked air conduction; Δ, masked air conduction; [, bone conduction. 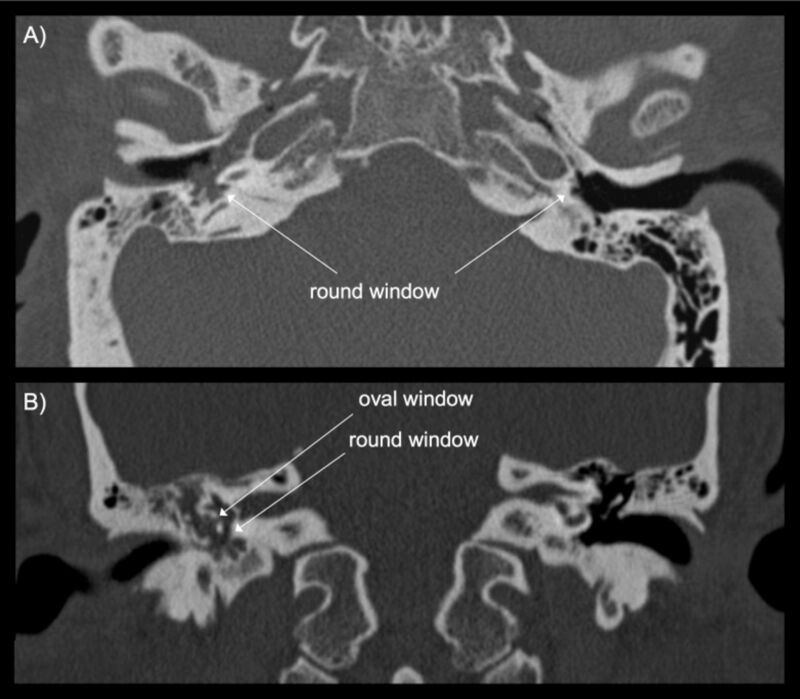 Axial (A) and coronal (B) computed tomography scans of the right and left temporal bones demonstrating opacification of the right middle ear cavity and mastoid air cells (arrows). The risks of CPAP therapy should also be considered when evaluating treatment options for patients with OSA. The main side effects of CPAP therapy are typically mild and include dryness of the nasal and oral mucosa, sneezing, congestion, aerophagia, sinusitis, and epistaxis. However, more serious adverse effects may occur, including pneumocephaly, pulmonary barotrauma, intraocular hypertension, and subcutaneous emphysema.3 The effects of positive airway pressure on the ear should not be overlooked as a potential consequence of CPAP therapy. Otic barotrauma has been well described with regard to air travel and deep sea diving; however, barotrauma as a result of CPAP has not been widely documented. Otic barotrauma results from a pressure differential between the middle ear and the external environment.4 While middle ear barotrauma can cause enough inflammation within the middle ear to result in conductive hearing loss, it may also be transmitted to the inner ear, causing a sensorineural hearing loss. This inner ear barotrauma may result from opening of the eustachian tube, resulting in a brisk inward movement of the round window that may cause disruption of the cochlear membranes or lead to formation of a perilymph fistula.4 A similar mechanism may occur with the use of CPAP, whereby a sudden increase in pressure in the middle ear, by way of the eustachian tube, disrupts the integrity of the oval or round window. Yung demonstrated the effects of CPAP therapy on patients with normal and atelectatic ears and determined that there was indeed an increase in middle ear pressure during the use of CPAP.5 Lin et al found that after swallowing during the use of CPAP, a maneuver that effectively opens the eustachian tube, middle ear pressures increased, and the increase in pressure was directly proportional to the pressure delivered via CPAP.6 Furthermore, a study designed by Sivri et al determined that middle ear pressure increased significantly after 6 months of CPAP therapy.7 The evidence suggests that the use of CPAP increases pressure within the middle ear cavity. While the benefits of CPAP are clear, we must take into account its rare but possible effects on ear structure and function. While many studies describe an increase in middle ear pressure with the use of CPAP, few describe the effects of this increased pressure on the middle ear, such as the otic barotrauma described in this case. With the increased prevalence of OSA, it is important to understand the risks associated with CPAP therapy. Furthermore, this case brings attention to the importance of patient education when initiating therapy with CPAP. Reminding patients that the appropriate pressure is determined via a titration study and should not be adjusted without consultation with a physician is an important step that could help prevent barotrauma injuries. Portions of these data were previously presented as a poster in the 118th annual Combined Otolaryngology Spring Meeting in Boston, MA, April 2015.